Wonde Proud Technology specializes in high-performance and advanced GPS-equipment manufacture since 2003. Company headquarters is located in Taiwan. For many years in business the company approved itself in the military, service and commercial sectors, including wholesale and retail trade. 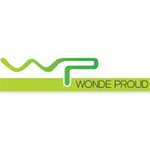 The company grows fast and today more than three million Wonde Proud Technology trackers are used worldwide. The chart below shows the changes within the last 30 days in the number units of Wonde Proud Technology devices type are connected to Wialon Data Center.